When I think of “outsize people,” I think of individuals who have “larger than life,” flamboyant personalities, and I admit that I’m often intrigued by those sorts of people, usually attracted to their seemingly carefree and spirited souls. Growing up in a small NC town, I encountered a few outsize personalities in my town, but, most often when I was young, I encountered larger than life personalities on a TV or movie screen. 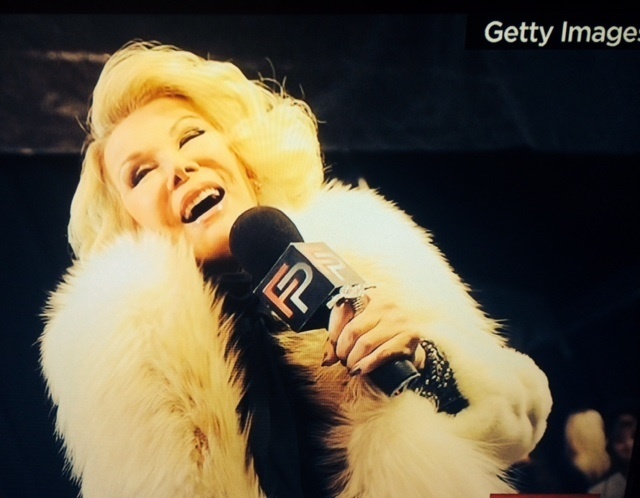 One of the outrageous personalities that I recall from my youthful, TV-watching days was Joan Rivers. I remember listening to all of Joan’s quick-witted, over-the-top, and, sometimes, off-putting jokes. And, I remember all of the times that Joan’s oversized personality put an oversized smile on my face. What about you? Do you know any “outsize personalities?” If so, what do you think of those people? Or, are you the holder of an outsize personality? Or, maybe your favorite outsize personality belongs to one of your pets? Or, maybe the most outrageous personalities that you’ve encountered have been characters within the stories that you’ve been told, written or read? For example, Tom Wolfe a favorite author of mine, has introduced me to many “over the top” fictional characters. So, let me know. Let me hear about the outsize personalities who have most impacted you. In a World where so many strive to meet the expectations of others and be something they are not, We could definitely use more ONE OF A KIND PEOPLE. My Dad definitely had a Larger than Life Personality and that is one of the things I always most admired about him. I agree, Linda. Today, originals are few and far between. Thanks for reading!